They say that everything’s bigger in Texas, and our plans for Sunday in the Dallas/Fort Worth area started out huge. First a tour of Texas Motor Speedway. Then a tour of Globe Life Park, which is the current ridiculous corporate name for the ballpark where the Texas Rangers play. Then all sorts of fun stuff in Dallas proper. They also say that man plans and G-d laughs. Because we had to start the day with a three-hour drive just to get to Dallas, we knew we would have to cut out a few items from the itinerary. The first to go was Texas Motor Speedway. We’re not actually racing fans, and we already took a tour of the Talladega racetrack on a previous road trip, so really, how many racetracks do two non-racing fans need to tour? Next to get crossed off the list was the tour of Globe Life Park. I would have loved to see a Rangers game but they’re not in town until Monday night, so all we’d be doing is touring the stadium. I’ve already seen a game there back when it had a better name, and frankly I’m getting a little bit of ballpark tour fatigue. The stadiums change but the tours are pretty much the same every time, which we know because we’ve been on six of them so far. We have no emotional attachment to this park in particular, so it just didn’t seem that exciting to sit inside yet another press box. At least, not while there were better options. So we headed straight into downtown Dallas, which is absolutely beautiful. The skyline is no NYC but it’s pretty hefty, not too clustered or spread out, and includes some really interestingly shaped buildings. 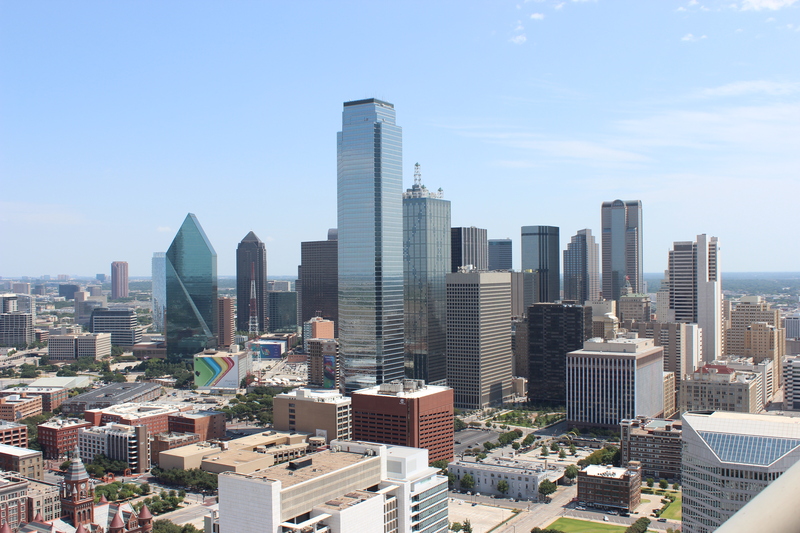 Dallas is also clean and reasonably easy to drive through, especially for a major city. 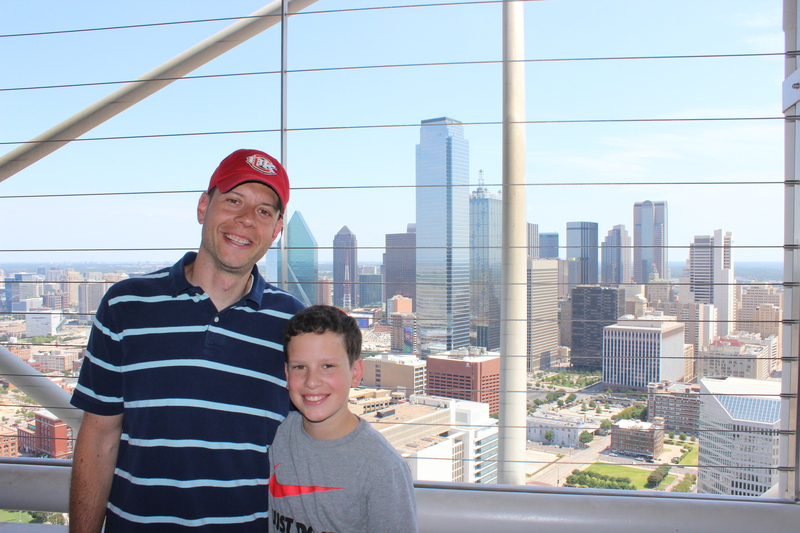 Our first stop was Reunion Tower, which is hardly the tallest building in town but has the highest observation deck. We headed straight to the top for fantastic 360-degree views of the city, which had the added benefit of helping to orient us. Sam’s favorite part was using those mounted binoculars they have at places like this to zoom in on the people swimming in the pool at the Omni Hotel several block away. He thought he saw a naked guy sitting at the poolside bar but then discovered that the guy was wearing a bathing suit. Phew! Then it was time to get serious. 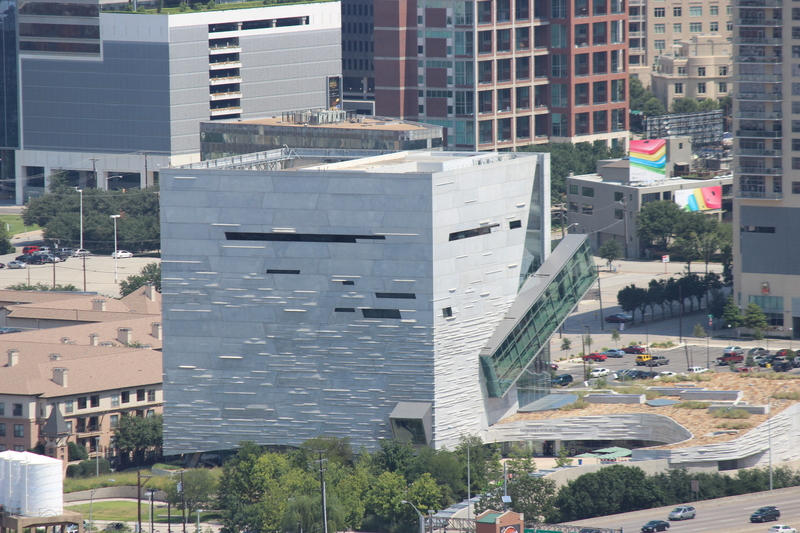 President Kennedy was assassinated in Dallas, and the former Texas School Book Depository building from where Lee Harvey Oswald fired the fatal shots has been turned into a museum about Kennedy, his presidency, and the assassination. It’s called the Sixth Floor Museum because that’s the floor Oswald shot from, and the entire exhibit is located there. The window from where the shots were fired. Apparently the smart thing to do is to order tickets online in advance so that you don’t have to wait on the 35-minute line to buy tickets. We did not do the smart thing. But eventually we got in and made our way through the museum, which is very well done on pretty much every level except for the ticket line. Everyone entering gets an audio guide, which was super informative. The exhibits start with some background about Kennedy’s rise to power and the general mood and issues present in the country at the time. It then goes briefly into some of Kennedy’s challenges and accomplishments as president. Then it explains his trip to Texas, including why he was there, what he planned to do in Dallas, and the various decisions and events leading up to noon on November 22. Then it provides great detail about the motorcade, the shooting, the breaking of the news, the reactions of the Secret Service and of the country, etc. 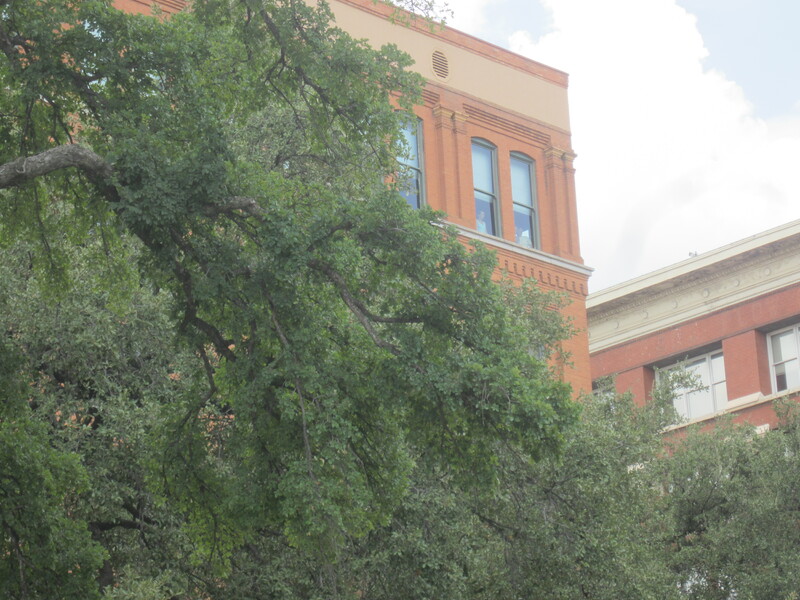 We stood just a few feet away from where Oswald fired the shots, and we looked out the same window to see the street Kennedy’s limo was driving down, the famous grassy knoll, etc. Finally it delves into the crime scene and the initial investigation, followed by a detailed discussion of the various commissions, findings, and conspiracy theories, treating all viewpoints with equal sobriety and respect. There were many things I learned from the exhibits. For example, I had never even thought about why Kennedy was in Dallas in the first place. I learned that he was there partly to raise money for his upcoming reelection campaign but also to quell a rift in the state Democratic party both to help solidify the governor’s position and so the party could do a better job of helping him carry the state. The most interesting thing I learned, though, was about Oswald. He had gotten a temp job as a stock boy in the warehouse just weeks before Kennedy’s arrival in Dallas, and an examination of his clipboard during the crime scene investigation revealed that he had not filled a single one of his orders. Photography is not allowed inside the exhibit hall, which is a little disappointing but I think it’s a net positive as it helps add to the appropriately serious tone. Sam and I were both somewhat relieved that the museum, while somber, was not overly sad and ended on an upbeat note about Kennedy’s legacy. We were so shaken after the Oklahoma City memorial that we were a little wary of another death museum, but it turned out OK. We decided not to buy souvenirs because it just didn’t seem appropriate. After leaving the museum we walked over to the grassy knoll and unfortunately witnessed a very different mood. 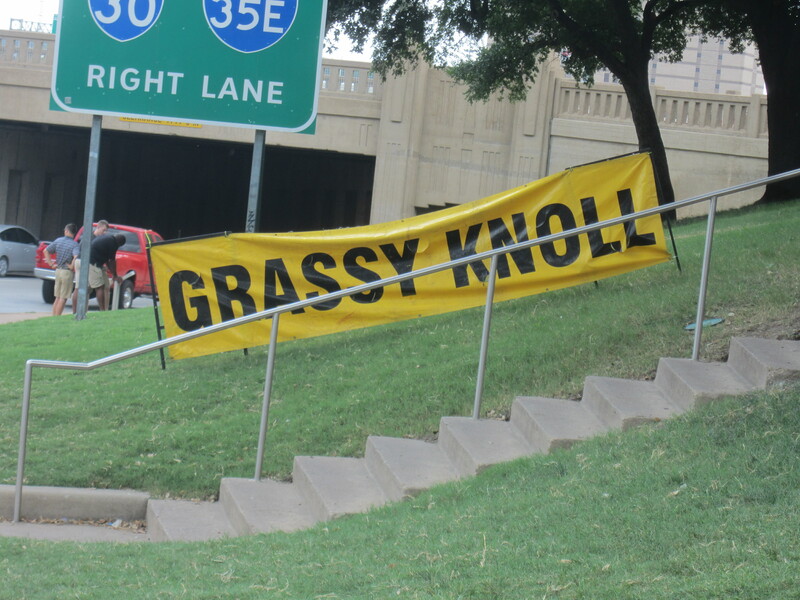 The giant, bright yellow sign saying “GRASSY KNOLL” should have been the first clue that the place of Kennedy’s death had been turned into a tourist site, but Sam and I foolishly had higher hopes for humanity. 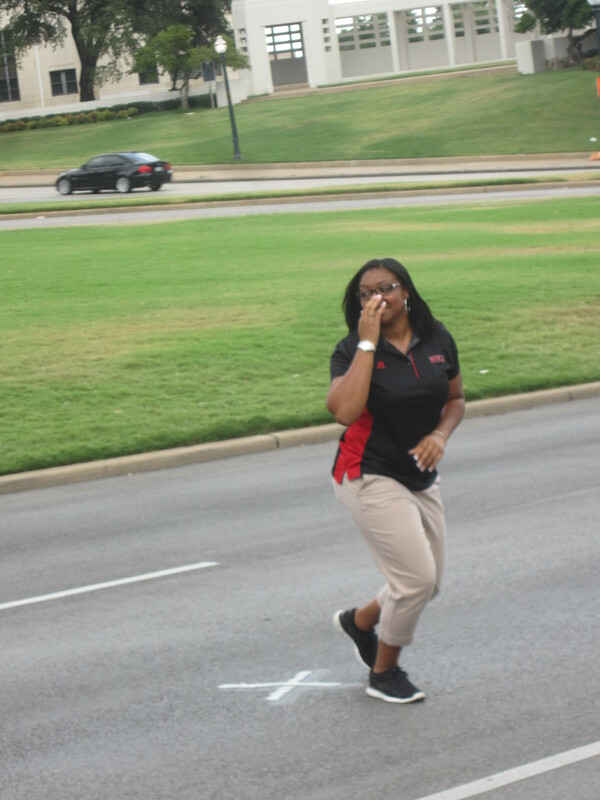 In the street where Kennedy was shot there’s a permanent white X marking the first time Kennedy was hit and another X a little further down marking the fatal shot. 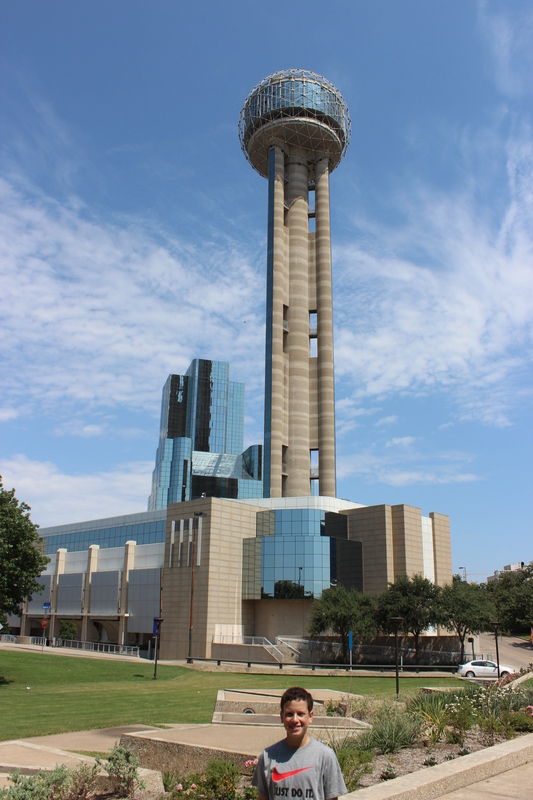 Throngs of tourists were running out into the street and posing for pictures standing on the X’s with big grins on their faces as if they were standing on the Reunion Tower observation deck. Sam and I were both horrified that people could be smiling in the spot where a U.S. President was murdered. OMG, this is so much fun! 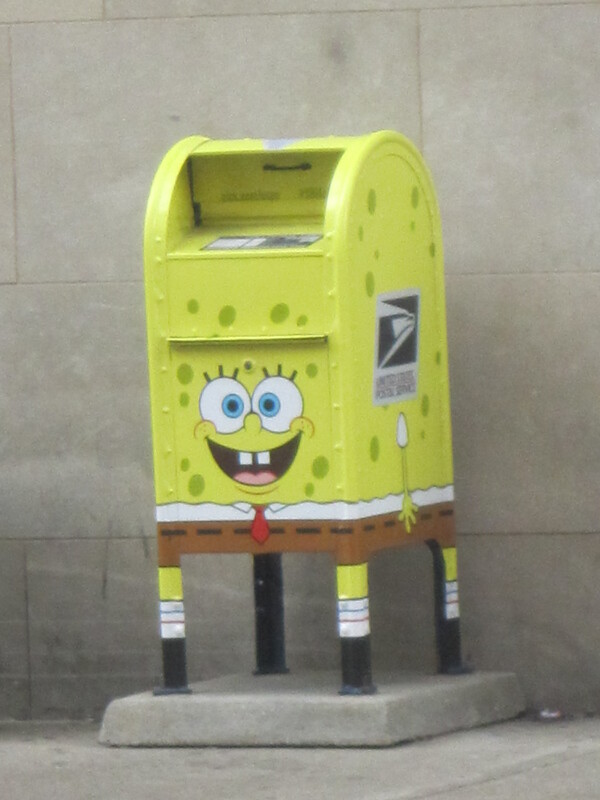 We have no idea why it’s painted like this but it made it hard not to smile. From there we went in search of more smiles at the relatively new Perot Museum of Nature and Science. It took us a while to get there because Sam accidentally set the GPS to the museum’s secondary location a few miles away. We went there, found out we were in the wrong place, and then had to sit in traffic trying to get back. When we finally got to the right museum we had another fiasco just trying to get into a parking lot. Eventually we made it inside the museum and we had a fantastic time. It was awesome outside and in. Favorite features included the glass-enclosed four-story escalator that provides fantastic views of the city, the musical staircase (It’s like the movie Big but on stairs! ), the earthquake simulator, and the racetrack that lets you race alongside a video of your choice of various professional athletes or a Tyrannosaurus Rex (Sam raced a professional soccer player whose name I didn’t notice, and Sam won thanks to a major false start). The best part, though, were the 3-D movies. We saw one about dinosaurs that was so good we bought tickets to a second one about reintroducing captive pandas to the wild in hopes of repopulating the species. Confession: I slept through most of the dinosaur movie. I didn’t mean to, but we both slept horribly Saturday night and woke up early Sunday to get to Dallas at a reasonable hour. When we finally got kicked out of the museum after it closed, it was time for dinner. There’s a big Jewish community in Dallas and several kosher restaurants, so on Sunday morning I took to Facebook and asked if anyone could recommend one of the many restaurants. It turns out that Abigail, a friend of mine from high school whom I hadn’t seen since, lives in Dallas and invited us to join her family for dinner. We ended up at a place called Meat Point, which was a typical kosher restaurant in that it is mainly Israeli food but also offers a few Italian dishes and some random Asian food. In a place like that, the smart play is always to stick to the Israeli choices. We did, and dinner was pretty good. Catching up with Abigail and meeting her family was even better, and to top it all off she sent us off with a tin of home-baked cookies! Time flew, and before I knew it it was almost 8. This would not have been a problem except that it’s a 4.5-hour drive from Dallas to Little Rock, and if we’re going to have enough time to do everything we’re hoping to do there, we needed to get some serious driving done tonight. Unfortunately we hit several snags. For starters, we were completely exhausted from long day after getting almost no sleep the night before, so I figured I would drive until around 9:30 and then wed find a place to crash. Then after 15 minute of driving, major construction closed two lanes and left traffic at a near stand-still for a half hour. I reluctantly decided to make up for the delay by driving a little farther, so we pushed ourselves until 10 p.m., at which point we arrived in Mt. Pleasant, Texas in search of a cheap motel. We were thoroughly spent and were relieved to find a Quality Inn, which is usually reliable and was even cheaper than I had hoped. However, we soon found out why. When we entered our room we found two massive cockroaches in the bathroom, one dead and one on its back still kicking. I guess everything really is bigger in Texas. We were devastated. We knew we could not stay there, but the thought of repacking the car and finding a new motel was more than we could bear. In the end we chose to leave. We repacked the car and I stopped off at the front desk and told the woman that we needed a refund and couldn’t stay there. She didn’t even ask why; I assume she knew. Down the street was a Days Inn. I have a general policy to never stay in a Days Inn, and this particular Days Inn is a great example of why. The whole building is in decrepit shape and the room we were put in is grimy and falling apart. The tub is full of spackle, the carpet is coming apart, and the A/C only sort-of works. But it was 10:40, we were well past tired, and there were no giant insects to be seen. We didn’t get to do everything we wanted in Dallas, but we thoroughly enjoyed everything we did do, and I got the bonus of reconnecting with an old friend. Dallas quickly became one of our favorite cities, and we’re already talking about what we’ll do when we come back, whenever that will be. It’s just too bad the rest of the night didn’t go as well as the day did.